During a two-day public hearing, the Inter-American Court of Human Rights based in Costa Rica heard the case against the Colombian State for the murder of journalist Nelson Carvajal Carvajal on April 16, 1998. The case was submitted to the Court by the Inter-American Commission on Human Rights (IACHR) in October 2015, in consideration that there was no "serious, diligent and timely" investigation by the State to determine what happened in the Carvajal murder. The journalist's relatives also received threats and harassment after the killing. Judith Carvajal Carvajal, sister of the murdered journalist, testifies during the first day of the audience before the court on Aug. 22. Photo: Inter-American Court. For the IACHR, the lack of investigation and protection of family members, as well as impunity in the crime, have had "a chilling and intimidating effect" for the families to continue with the legal process, as well as for journalists in the area. 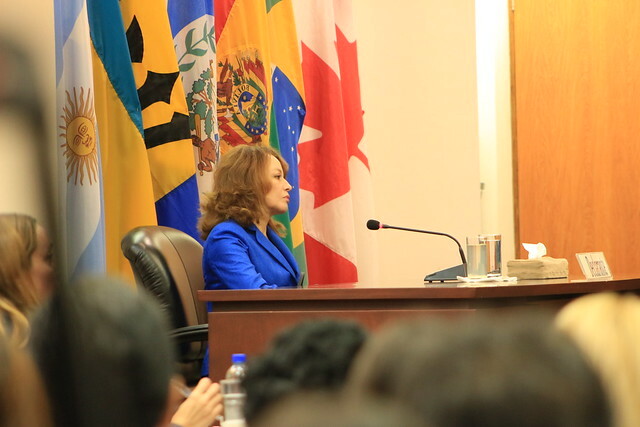 These arguments were presented by the Special Rapporteur for Freedom of Expression of the IACHR, Edison Lanza, during the presentation of the case at the hearing on Aug. 22. Lanza said that Carvajal "was murdered for his work as an investigative journalist, linked to investigations of political corruption and organized crime" and categorized it as an "emblematic case of violence against journalists and the subsequent impunity that has characterized these types of crimes in Colombia for more than two decades." The Rapporteur also said that by the time of Carvajal's assassination, Colombia was the most dangerous country to practice journalism in the hemisphere and that according to specialized records between 1977 and 2015, there were 152 homicides of journalists in the country. The entire criminal chain has been sentenced in only four of these cases, the Rapporteur said, citing expert German Rey. "The truth is that 19 years after the assassination of Nelson, the investigation initiated by these events seems to have been forgotten and runs the risk of prescribing without knowing the truth of what happened and determining someone responsible, material or intellectual. There is no responsibility or explanation to the victims or to society for an aberrant crime, against freedom of expression and against democracy," the Rapporteur said. According to Lanza, the Inter-American Court has the possibility of creating jurisprudence with this case. Judith Carvajal said that in view of the few advances in the investigation into the crime of her brother, the family had carried out investigations on their own that led them to meet with guerrilla members. According to her, all this information was given to the Colombian authorities. A prosecutor who was involved in the homicide investigation was also present as a State witness and explained why Colombia did take all the steps it could to resolve the crime. The expert presented by the IACHR, Carlos Lauría, former director of the Americas Program of the Committee for the Protection of Journalists, gave an overview of the context of violence in Colombia, the high levels of impunity in crimes against journalists in the country as well as shortcomings in the protection mechanism. Both in their closing arguments and in their presentation, the State representatives asserted that Colombia has no international responsibility because of the fact that steps have been taken to clarify the crime and because there was no "direct responsibility" of State officials in the murder of the journalist. Judges of the Court during the audience "Case of Carvajal Carvajal and others vs. Colombia." 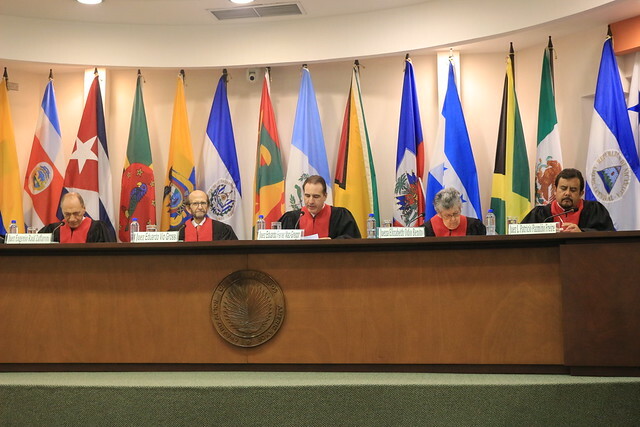 Photo: Inter-American Court. Regarding the possibility of the case prescribing - since 19 of the 20 years the authorities have to close it have passed - they assured that there are some mechanisms to prevent it. The State asked the Court not to condemn the country only for the purpose of "creating jurisprudence," especially since, according to one of the State agents, Colombia has made great strides in the protection of journalists. He emphasized how, for example, there were no murders of journalists in the country in 2016 due to work-related causes, and how the statute of limitations on crimes against journalists increased to 30 years. In its concluding observations, during the second day of the hearing, the IACHR, through Lanza, stated that States can not have a "double standard" in not undertaking diligent investigations while at the same time signing a resolution at the OAS where they commit to respect freedom of expression. Lanza asked the Court to declare the "violation of the rights to life, access to justice and freedom of expression, personal integrity and free residence and movement for failure to comply with the duty to investigate with due diligence and to judge and punish all those responsible for the murder of Nelson Carvajal Carvajal and protection of the relatives of the journalist in their struggle for truth and justice." He also requested that it establish that the crime against Carvajal was part of a "pattern of serious human rights violations against journalists in Colombia." The parties involved in the case have until Sept. 25 to send their final written arguments to the Court. Only after this, will the Court proceed to its analysis and eventually emit a sentence. Nelson Carvajal Carvajal was shot seven times by a hitman and killed in April 1998 as he left the Los Pinos School – which he had founded and where he was a teacher – in the municipality of Pitalito, department of Huila. Carvajal, 37, was the director of news program Momento Regional and other magazine radio programs in the area. According to the Foundation for Freedom of the Press (FLIP), he "stood out for his strong denunciations against the corruption of the local political class and its alleged relations with different armed actors." The IAPA, which has investigated the case since 2002, has said that the investigation of the crime has had "irregularities" that include the change of four prosecutors, one of whom received death threats. He also highlighted how people related to crime have been acquitted, including of accusations of being the intellectual author. For this reason, its arrival at the Court represents "a milestone in the fight against impunity” for the IAPA.